Jesus Christ instituted the Sacraments and entrusted them to his Church as a primary means of transmitting grace, which helps us to live the Christian life. This text presents each of the Seven Sacraments in its own chapter, explains how it is celebrated, and describes its purpose in the Christian life as an intimate encounter with Jesus Christ. 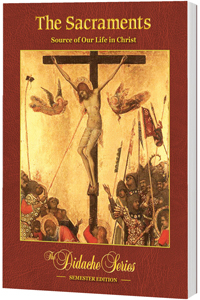 It also examines Christian liturgy as well as popular prayers, devotions, and sacramentals. This book corresponds to Book V: Sacraments as Privileged Encounters with Jesus Christ in the curriculum framework.